**Please note: I wrote this article while wired on coffee as a part of my extensive research methods, so please be prepared for an abundance of em-dashes, parentheticals, and reference markers, which hold my neurotic asides. Medically speaking, caffeinated coffee is detrimental to quality vocal health^; it dehydrates the vocal cords and causes a general damage to them. September 23 marks Cabaret Theatre's annual pairing of coffee and performance: Café Cabaret. Luckily, singing isn't the only medium of performance allowed (Rutgers’ ventriloquists, this is your time to SHINE), and all kinds of performance are encouraged (musicians, poets, dancers, actors, magicians, jugglers, contortionists, sword swallowers, tightrope walkers, looserope walkers, those people that used to do those motorcycle tricks in the Ringling Brothers shows where they'd get inside that spiral cage and zip around it (you know the stunt I'm talking about), mimes). So, what can I blog about if I haven't seen anything blog-worthy? Well, you clearly don't fully understand my ability to ramble on in a stream-of-consciousness, or how I love to hear myself talk (err, write). As such, I decided I'm going to rank musical theater songs to do with coffee, which is at least ~sort of~ aligned with Café Cabérét's theme (I'm trying my best, okay). This ranking is to be purely objective, and I will not have anybody messaging me later trying to debate these rankings because I swear on Maya (Cáfé Cábárét coordinator)'s head I will throw hands. First, as a prerequisite, the song must be readily available on Youtube (this disqualifies “Coffee, Black” from BIG because I can't find a studio version, but instead just get poor high school production versions) or any music streaming service (except for Google Play Music, because seriously, who actually cares about what's uploaded onto Google Play Music? Just get an iPhone and a Mac already and be a sheep like the rest of us). Second, another prerequisite, the song must have at least a verse dedicated to it about coffee, use coffee as a metaphor, or have coffee at its thematic core (for example, "Sunday" from Tick...Tick...BOOM! was disqualified because it only mentioned coffee in the chorus, was merely an aside, and is a detail in the song's being about Sunday brunch at a diner and the kinds of people that attend). Third, is the song entertaining on its own? 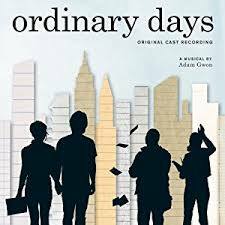 Away from staging, is it worthwhile to listen to it from a soundtrack? 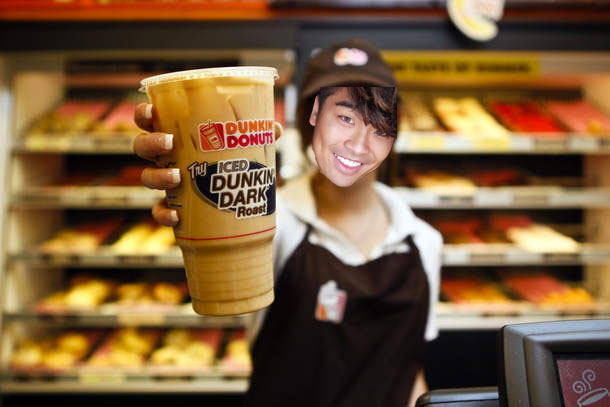 Fourth, how do the characters treat the coffee? Do they like it? Do they hate it? How do they take it? (re-read this parameter again, but in a catchier sing-song-y way to fully appreciate this one). Fifth, how vital is the coffee to the character? Like, do they need coffee or else they'll get a soft migraine around their right temple that mandates they take two Advil (totally not speaking from experience here). These are the rules and I won't hear a friggin' peep about them being weak. 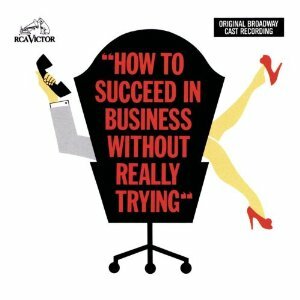 Now, without further ado, let's get down to (How to Succeed in) business. This song is painfully annoying and not entertaining in the least bit. The characters don't even care about coffee and are just using it for some dumb romantic metaphor. If I referred to my SO as the "cream in my coffee," I think she'd actually leave me for being cliché and being so non-essential, because, like, you don't NEED cream in your coffee—like, what if the guy is just saying this to get the girl into bed and he actually drinks it black or with almond milk or something? Idk. The guy in the song's intent sounds fishy to me. He could literally be saying she's actually insignificant to him and I will not rank highly a song that elevates a devious man, no sir. Honestly, this is my favorite song on this entire list. Idina's performance on the readily available cast recording is superb and a wildly entertaining on its own. But, while it scores highly along that parameter, it scores super low on the others. First of all, she doesn't even like coffee! That fact is central to the irony of the whole song, which allows it to get on this list, but oh my goodness how does somebody actually not like coffee. Like, I get if you're aware that it makes you anxious and have self-control, or really highly value unstained teeth; but true dislike? Heresy, imo. Another song I find seriously entertaining, yet gets ranked towards the bottom half. The performers whole argument in the song is that the issues with the world today is the pace at which people feel the need to do things, unwilling to rest and enjoy a nice cup of coffee in a mug, relaxing somewhere. While not a terrible argument, and one that the implication of coffee being the chosen thing to relax and enjoy for the sake of the argument, to me, expresses the high value the characters place on coffee…but 'ya boy needs his coffee on-the-go p often. The world and its pace are not changing for you anytime soon, I'm sorry, but that's the harsh reality. Succumb to its pace and, when you have a moment to relax, use it to indulge in a stiff bourbon that'll numb you until time feels slow enough to meet your unrealistic yearning instead. 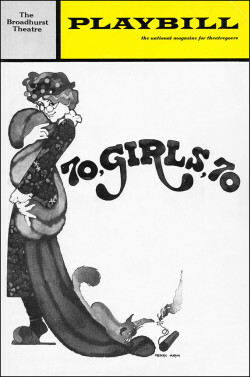 Also: what kind of name is 70, Girls, 70 for a musical anyways? This song is the epitome of overdone, but is sort of justified, I think, I guess? I dunno. I find this song both pretty entertaining, but also super boring, which is kind of how I think of myself, so my ego won’t allow this to not not be in the top three because of that parallel and the fact that my ego is fragile. In itself though, lyrically, the song is super darn cute, and the fact that coffee catalyzes the romance gives it bonus points (I’m making the rules, I say love gets bonus points, okay?). Also, “Who’d have thought that love could be so caffeinated,” without the romantic context of the song is p much my motto, so more bonus points. This song actually causes me a lot of stress and confusion, which is why I put it at number two because we love the things that cause us agony, amiright? It’s a lot of fun musically and lyrically, and Austin drinks his coffee black (points), but it can’t be any higher than number three because 1) they’re both really condescending about their coffee views, which is a p annoying part of coffee culture, I M O—just enjoy your coffee how you like it, why get all up in other peoples’ opinions and values when they don’t transgress on your life experience (spoiler: this applies to ideology as well. Yeah, this post just got political, boy) and 2) there’s that whole phone conversation that is just really super not good, especially in that whole aging pickle pregnant woman thing. Like what? Pickles are attractive to whoever, whenever, and if you think otherwise you’re wrong. Pickles are great (shoutout to the Hansel marketing). (Fun fact: did you know our producer, Ajit J. Mathews, performed this song in a musical revue once? If anybody has a copy of it somewhere, please forward it to drn35@scarletmail.rutgers.edu, I beg). The song you knew was coming all along. It’s been a nice journey though, right, I hope, (please say yes)? This song fulfills everything we’ve been examining to the absolute max: it’s a freaking bop and a half, the performers love their coffee maddeningly, and coffee is literally so essential to them that a piece of them DIES if they don’t have time to get more. DIES. This is a hec*ing LIFE OR DEATH situation on our hands here, all because of coffee! To place this any lower than first would be an absolute injustice. Plus, I get to listen to this on Spotify from the revival soundtrack that has Daniel Radcliffe’s face on the cover, which is great considering he’s such a handsome man whose mere appearance reminds me of Harry Potter and my youth and the time before everything already started getting sad with age. Well, that’s the list! I would ask you what you thought, but, remember, this is objective fact—I operate only in the realm of objectivity. Please do not @ me, tysm. If you’ve stuck around to read this article in its entirety I want to tysm pt. 2 (the remix) and ask you to stop procrastinating and get back to whatever work it is you should be doing right now because that’s the only reason I can imagine anybody sticking this whole thing out, tbh. Kk, ttyl. Cáfé Cábárét will be this Saturday night at Cabaret Theatre at 7PM. It's FREE and we'll have coffee(!) AND food(!!). Looking forward to seeing you there! ^Upon further review, I found out that decaffeinated coffee is actually fine, apparently; but like, seriously, what's the purpose of decaf anyways? That’s like choosing to ride the merry-go-round when some badass rollercoaster is right next to it. ^^Literally none of you 6 readers sent me an explanation for the origin of the phrase "cat's out of the bag," and I still get it and it's really bothering me help.